I took my little one to see Winnie The Pooh this past weekend and she LOVED it! 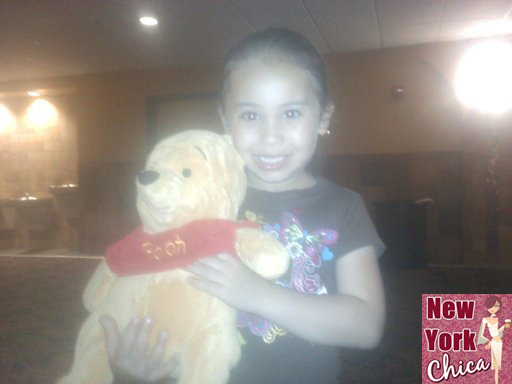 She was ready with her Pooh Bear in hand that I got for her during a Disney Press Junket. She loved it so much, she wants to see it again. Thank you Disney! Pooh Bear. I have memories of Winnie the Pooh from my own childhood. This is a sweet photo. She’s so adorable! Glad you had a good time. Will consider taking my son! It’s ALWAYS time for Pooh Bear! She loved it, but what did you think of the film? Is it good for grown ups too? I can’t wait to take my 2 1/2 year old to see it. He loves Tigger! We saw this last night! My kids loved it! I am nearly 23 years old but i grew up with the hundred acre woods friends and i cannot wait to see this movie!! I was so happy Disney kept it ‘retro’ it was refreshing not to see double entendre and inuendo, just a clean cartoon! Pooh is super cute, and your daughter gets taller everytime I see a new picture! She is soooo cute! I love Winnie the Pooh. One year I bought the Zen of Pooh just for myself. Lots of wisdom in there.